Staphylococcus aureus colony morphology and microscopic appearance, basic characteristic and tests for identification of S.aureus bacteria. 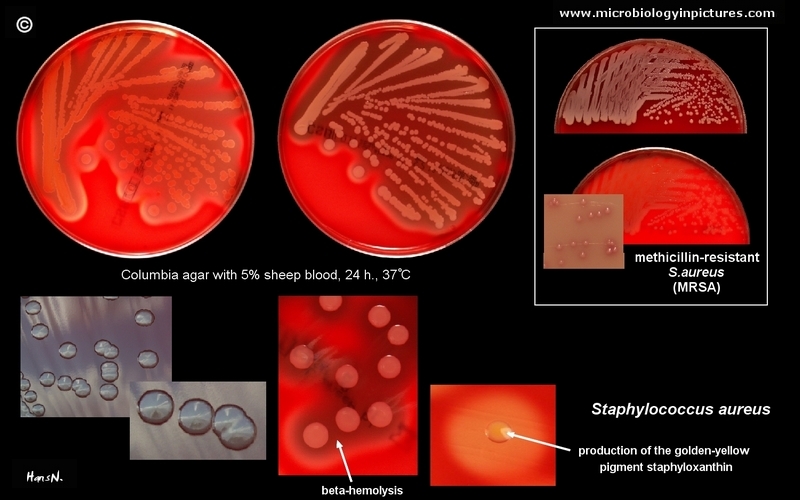 Images of Staphylococcus aureus. Antibiotic treatment of staphylococcal infections. Staphylococcus aureus on Columbia agar with 5% defibrinated sheep blood (Bio-Rad™). Individual colonies on agar are round, convex, and 1-4 mm in diameter with a sharp border. On blood agar plates, colonies of Staphylococcus aureus are frequently surrounded by zones of clear beta-hemolysis. The golden appearance of colonies of some strains is the etymological root of the bacteria's name; aureus meaning "golden" in Latin. Methicillin-resistant strains of Staphylococcus aureus (i.e. MRSA) often have only weak or no beta-hemolysis and special cultivation media with oxacillin, mannitol and NaCl for their isolation are used. MRSA is able to grow on this media and produce colonies of certain color, depending on used pH indicator (in this picture pink). Staphylococcus aureus may occur as a commensal on human skin; it also occurs in the nose frequently (in about a third of the population) and throat less commonly. The occurrence of S. aureus under these circumstances does not always indicate infection and therefore does not always require treatment (indeed, treatment may be ineffective and re-colonisation may occur). It can survive on domesticated animals such as dogs, cats and horses. S. aureus can infect other tissues when barriers have been breached (e.g., skin or mucosal lining). This leads to furuncles (boils) and carbuncles (a collection of furuncles). In infants S. aureus infection can cause a severe disease Staphylococcal scalded skin syndrome (SSSS). Deeply penetrating S. aureus infections can be severe. Prosthetic joints put a person at particular risk for septic arthritis, and staphylococcal endocarditis (infection of the heart valves) and pneumonia, which may be rapidly spread.